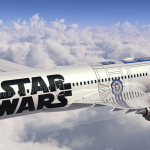 Meet the new fleet of Star Wars passenger planes. 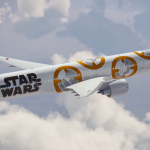 The Japanese airline might as well be called the official airline of Star Wars. Today marks the one-month mark until the latest Star Wars film comes out and it seems like everything that has been teased regarding the film has been a “spoiler” in some way. 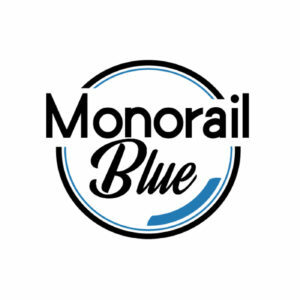 Fear not, friends, as we’d like to mark this important day with something that won’t spoil, but celebrate the franchise. 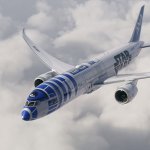 Earlier this year at Star Wars Celebration, we had the opportunity to meet with All Nippon/ANA Airways as they showed off their newest themed plane: the R2-D2 plane. The Japanese airline representatives said that the droid-skinned aircraft would be the first in three new planes that would go into service later in 2015 and in 2016. 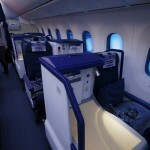 As of today, the R2-D2 plane is now flying passengers internationally and domestically in Japan and other destinations. 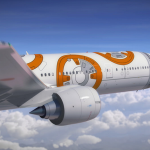 The other planes include a BB-8 plane, as well as a generic Star Wars logo’d plane. It’s all a perfect marketing effort between Disney and All Nippon to promote the film to Japanese audiences who very much love everything Star Wars and are excited to see Episode 7. 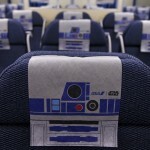 These planes aren’t just showing off Star Wars outside of them, but inside as well! 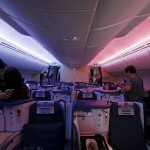 Mood lighting, headrests, and even the flight attendants holding lightsabers during the safety checks are all part of the flying experience. Unfortunately, you cannot order Star Wars-themed foods like Bantha Milk. 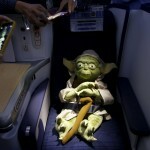 To make up for that, in-flight entertainment does include the past six episodes of Star Wars, though! 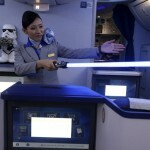 Are you ready to fly the friendly skies with the Force? Click HERE to find out when and where the planes will be flying.